Description: Q-124 blasts northward out of Danville. Description: CSXT 7328 and CSXT 7303 bring in this Q55208. Description: A CSX freight rolls east 5 miles east of Muncie at Selma on the Indianapolis Line. Description: Q116 is right on Q174's tail at about 11:45 with an ex-Con leading the way. Description: Q116 sails east with 7328/4753/4782 and about 60 cars. Description: CA-11 heading southbound just north of the RICK marker. Description: CA-11 sotuh through Carney's Point, NJ. 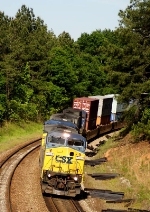 Description: A trio of CSX GE's Heads south toward La Grange, GA on the main at Standing Rock siding.